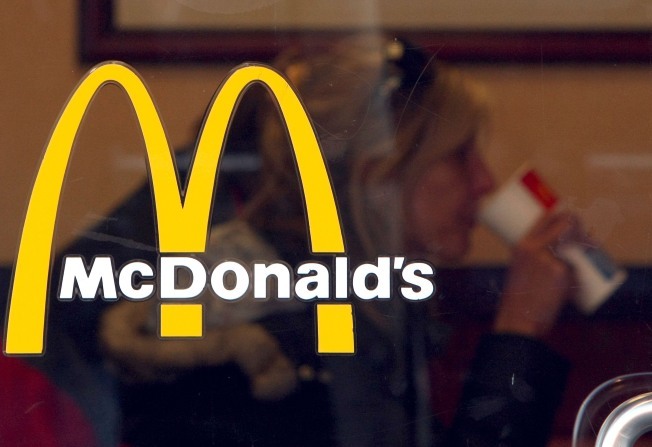 A McDonald's customer is seen through the window at a McDonald's restaurant in San Francisco. It may be a struggling economy, but looking to eat on the cheap made for a good 2008 for McDonald's Corp and for its chief executive. The nation’s fast-food restaurants rolled out big discounts and heavily promoted value last year, and an Associated Press analysis of a Security and Exchange Commission filing shows that as the chief of one of only two Dow companies whose stock rose in 2008, McDonald's Chief Executive Jim Skinner got a 70 percent boost in his compensation for the year. Skinner received a total of $13.6 million for the fiscal year, up from $7.9 million in 2007. Included in that figure are a base salary of $1.3 million -- a 6 percent boost from his 2007 salary -- and a cash bonus of $4.6 million, up from his 2007 bonus of $3.1 million. Skinner also received perquisites, or "perks," of $557,674, including $483,725 paid into a profit-sharing and deferred-bonus plan. So while Skinner's wallet fattens, so too does the nation's collective waistline.